A baby monitor is an essential must-have for any new parent. A monitor extends your “parenting range” so you can keep your eyes and ears on your little one at all times. You can finally take that shower you’ve been dying to take or binge watch your favorite show on the couch and still keep your tabs on your baby…hallelujah! Baby monitors offer you an added level of security and peace-of-mind. However, if your monitor has a high level of interference, transmits fuzzy pictures or loses power quickly it can be a technical nightmare and lead to many sleepless nights. Technical issues with a monitor increase stress and anxiety for a new parent who is already sleep deprived. A monitor should give new parents comfort, reassurance, and peace-of-mind. Reliability in a baby monitor is key! A monitor has a simple job. It needs to transmit audio or video from where the baby is to where you are. The monitor is usually a two-piece device. A base that stays in the baby’s room or where the baby is and a device you carry with you so you can see/hear your baby. There are audio only and audio/video monitors. Some operate over your home’s WiFi network. The ones we use operate over our WiFi network and this has pros and cons. I’ll discuss these when we talk about the monitors we have used. What to consider when purchasing a baby monitor? You want to be sure that the baby monitor transmits clear images and clear audio with minimal to no interference. Interference can come from other devices in your home or even your neighbors. Security of the monitor is important. Be sure the device uses Digital Enhanced Cordless Technology or DECT. If it uses your home’s WiFi, be sure your home’s WiFi is secure. In our experience, the range can vary a lot with monitors. Your home’s size and design can impact the monitor’s range. So when it comes to range, go big or go home. The bigger the range the better. You never want the range to be a problem. The base unit on most baby monitors plugs in and most of the receivers use rechargeable batteries. The problem is, so many monitors burn through even the rechargeable batteries very quickly. Look for models with a long battery life. If you use a baby monitor with a camera, make sure it has night vision so you can see your baby when she is sleeping in the dark. You will want a baby monitor with an easily visible low battery light indicator. The most important part of the video monitor will be that it transmits clear images. Clarity is key when choosing a video monitor. Should I buy an Audio or Video Monitor? This is such a personal choice, but let’s talk about the different options and some pros and cons of both. Audio monitors are sound only. Some of them have lights that also alert to sound in the baby’s room, but they do not offer any visual images. Audio monitors come in both analog and digital. Digital or DECT being the most popular and the type we would recommend you purchase. They are the most reliable and the most secure. If you think you might obsess over watching the video monitor (some parents have said they returned their video monitors and went with audio because of that) audio is the way to go for peace of mind. Video monitors allow you to see and hear your baby. They are a great choice. There are two options. The first uses 2.4GHz FHSS wireless transmission to transmit on a closed secure system and the second uses your homes wi-fi network. Which one you choose comes down to personal choice, how your home is set up and what other smart devices you may have in use. If you use a wi-fi video monitor and your wi-fi goes down, so does your monitor. Some parents find having the video monitor too much and they obsess over watching it. The VTech DM221 Audio Baby Monitor is designed with parent peace of mind. The device uses DECT technology to reduce interference and increase security so all you hear is your baby. You can mute the sound, and the device will light up if it detects sounds in the baby’s room. The unit has two-way communication so you can talk to your baby. Rechargeable batteries offer up to 18 hours of monitoring time. The parent unit can be plugged into an outlet or run on two AAA batteries. 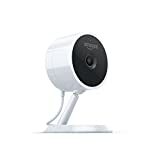 The Infant Optics DXR-8 Video Baby Monitor is a great choice if you are looking for a video baby monitor that doesn’t need to use the wi-fi system in your home. The infant optics monitor runs on a closed system that is 2.4GHz FHSS wireless transmission. The base unit and parent unit only pair with each other making them very secure. The camera has an interchangeable lens system. You can choose the best lens for viewing. Lenses can be changed in a matter of seconds. The video is streamed in real time to a sleek LCD monitor that is 3.5 inches. Two features we really like about this monitor are the remote room temperature sensing feature and the screen off and audio on mode which can really help save on the battery life. 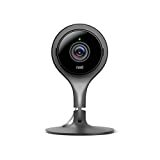 The nest cam security camera for indoors is sleek and easy to install. These are the monitors we use (along with our Nest thermostat) and I love that they work with Amazon’s Alexa. They plug in and you never have to worry about the batteries dying. 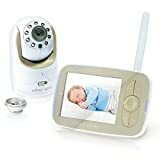 The cameras have a built-in speaker and microphone which is great to listen to your baby and offer a soothing word (while praying she goes back to sleep). The camera will live-stream 24/7, you can watch on your phone or tablet. Some people have reported trouble with the streaming portion, so keep that in mind if you go this route. The camera is light-weight and I think is very unobtrusive in the home. The camera comes with a quick start guide and a welcome guide. Nest customer support is always top notch. The Philips Avent DECT Baby Monitor is a great choice for parents looking for an audio monitor that works in a larger home because it has a long range and excellent battery life. It uses secure DECT technology to ensure no interference from other devices so you only hear your baby. It offers a secure and private connection. The Philips Avent Monitor can help soothe a cranky baby who isn’t ready to sleep with up to 5 different lullabies. The monitor offers two-way communication so can talk to your baby from another room. It also offers the ability to monitor the temperature in your baby’s room. The Babysense Video Baby Monitor is a great value and made our list because of a wealth of features and great ratings from parents. 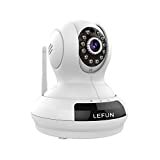 This baby monitor is another great choice for parents who want a video monitor but do not want one that runs on their home Wi-Fi. This monitor uses a secure 2.4 GHz FHSS closed system to provide clear high definition video streaming. The monitor has two-way communication so you can soothe your baby with your voice. It also has the option to play lullabies which we thought was a great option. Night vision ensures you’ll be able to get a clear image of your sleeping infant. The unit has in room temperature sensing and alerts. The display is tabletop or wall mountable which is a great added feature. It is expandable up to four cameras.